EURUSD is chiefly under the influence of some economic reports in Europe such as PMI – Composite (M/M), PMI – Manufacturing (M/M) and PMI – Services (M/M) and the US is releasing Markit Manuf PMI	, Existing Home Sales and Richmond Manuf Index (M/M). 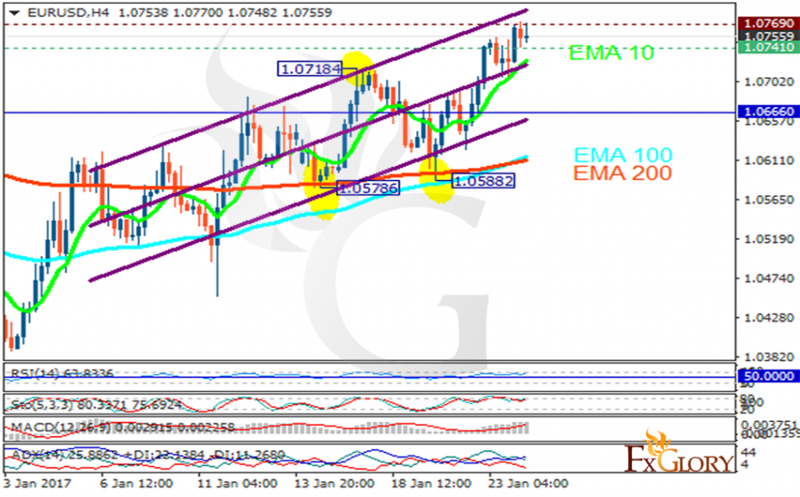 The support rests at 1.07410 with resistance at 1.07690 which both lines are above the weekly pivot point at 1.06660. The EMA of 10 is moving with bullish bias and it is above the EMA of 100 and the EMA of 200. The RSI is moving in overbought area, the Stochastic is moving in its maximum rate and the MACD indicator is in positive territory. The ADX is showing a buy signal. While 1.0769 is a very strong resistance zone for EURUSD, bears will come back trying to keep the price neutral however since all the indicators are showing upward momentum, it’s better for traders to wait for a better chart setup.